Bad Homburg, 30 November 2018– Handling resources in an efficient and responsible manner has long played an important role in the German plastics packaging industry – in ecological as well as in economic terms. While the arguments for plastics packaging are convincing with regard to functionality and efficient use of resources, the German plastics packaging industry, under the umbrella of the IK Industrievereinigung Kunststoffverpackungen (German Association for Plastics Packaging and Films), has now set itself ambitious but also realistic targets to strengthen closed loop recycling. With these targets, the industry, which comprises predominantly medium-sized businesses, is making its contribution towards a sustainable plastics packaging strategy and taking a stand against the sweeping condemnation of plastic packages with commitment and facts in the emotional and negatively charged public debate. According to the latest figures, German manufacturers already use 400,000 tonnes of recycled material in the production of plastic packages. The EU Commission is calling for the use of a total of 10 million tonnes of recycled material in the European packaging industry by 2025. “By significantly expanding the volume of recycling material used from the current level of 400,000 tonnes to 1 million tonnes, we wish to meet our responsibility and give a clear signal that Germany is not just sitting back with the milestones achieved so far in the circular economy, but also intends to strengthen its leading role in Europe,” states IK Managing Director Dr Isabell Schmidt. 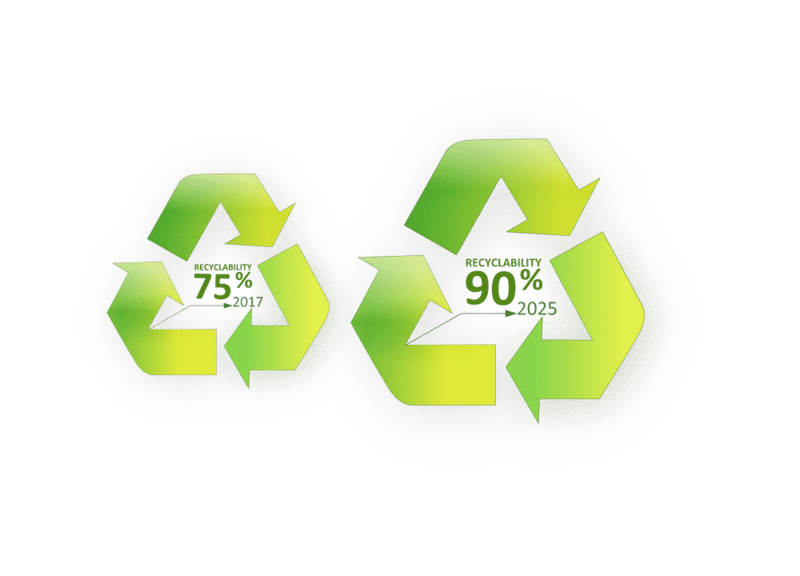 By 2025, at least 90 per cent of household packaging will be capable of being recycled or reused. Over 75 per cent of plastic packages are already capable of being recycled or reused in terms of volumes collected for the “Yellow Sack” and PET drinks bottles collection schemes. “We regard the 90 per cent target we aim to meet not just as realistic but also as ecologically sound,” explains Dr Schmidt. “On the one hand, we cannot set a 100 % target for the overall market, which sees many packaged products imported from abroad. On the other hand, people need to realise that the necessary changes to some packages may even have a negative impact on their overall ecological footprint, as more material is required.” One example are the ultra-thin films with highly effective barrier layers to protect sensitive foodstuffs. Rejecting these highly innovative solutions in favour of recyclability will result in the use of considerably more material to achieve the same level of performance, if that is at all possible. 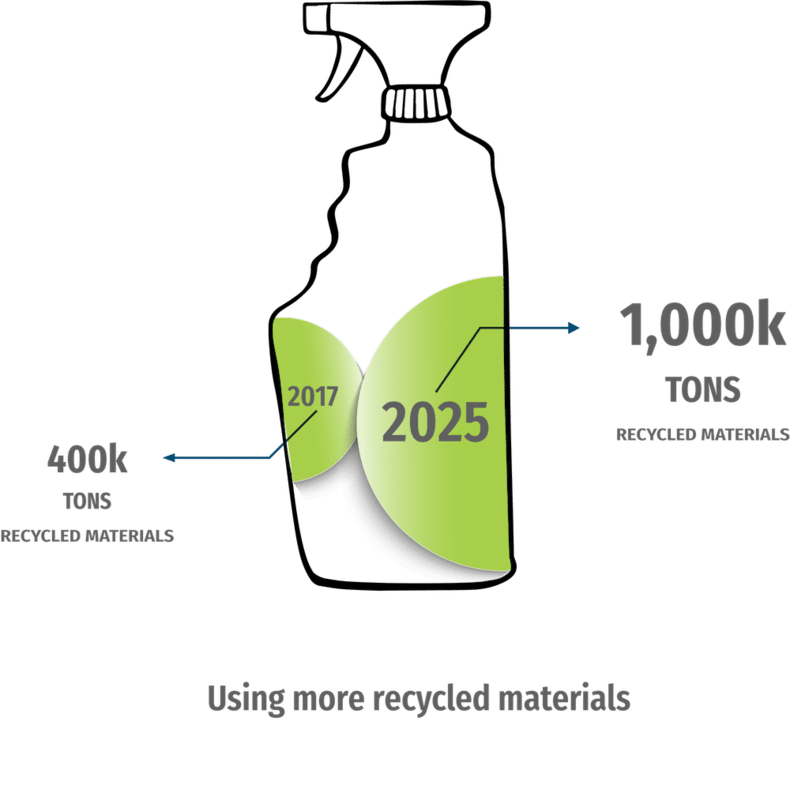 “There is, however, still a lot of potential in some areas to improve recyclability without detracting from the efficiency of the material. That’s what we intend to concentrate on,” states Dr Schmidt. An independent third party is to monitor on a regular basis how the two sustainability targets are being met. 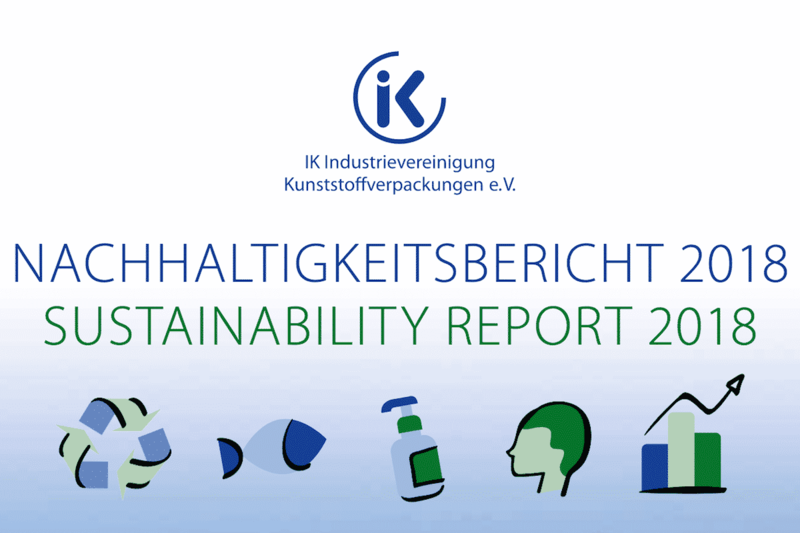 The current status of sustainability in the plastics packaging industry is documented with the corresponding key indicators in the recently published IK Sustainability Report 2018. It also includes the IK’s position on the EU’s plastics strategy and the IK’s recycling targets.